Improvements to Roku's high-end set-top boxes don't add up to a better value—unless you need 4K HDR video. Even before the Roku Ultra arrived, spending more than $100 on a Roku box wasn't really necessary. 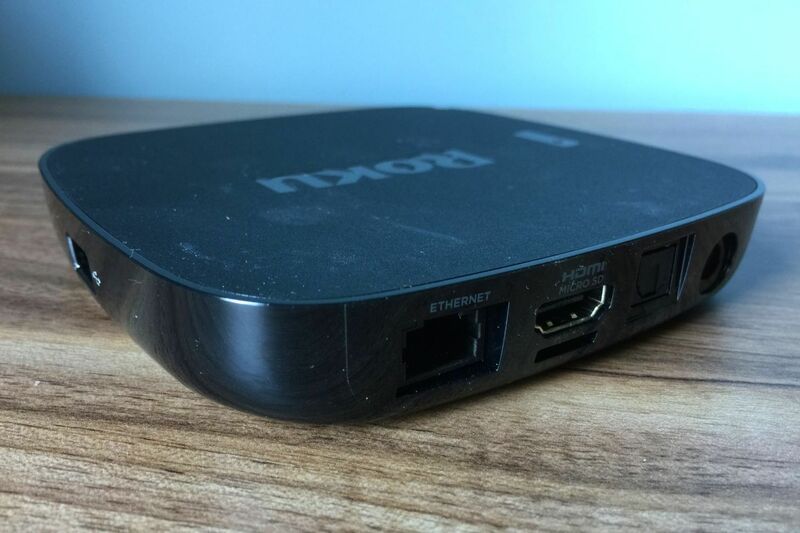 Last year's Roku 4 was a compromised device at $130, with an internal fan and an unusually large footprint for a media streamer. 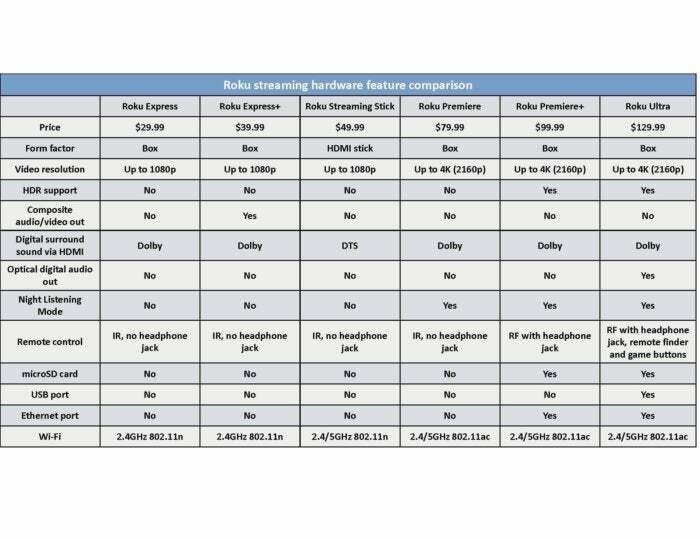 And besides its support for 4K streaming, the experience wasn't much different from the $100 Roku 3, which remained the better value for most people. Pricier Roku models are an even tougher sell now. While the $130 Roku Ultra is more compact than its predecessor and adds 4K HDR video support, those same features are also available in the $100 Roku Premiere+. And if you don't have a 4K television, you'll probably do just fine with the excellent Roku Streaming Stick, which launched earlier this year for just $50. The bigger question is whether you should stick with Roku's platform in the first place. 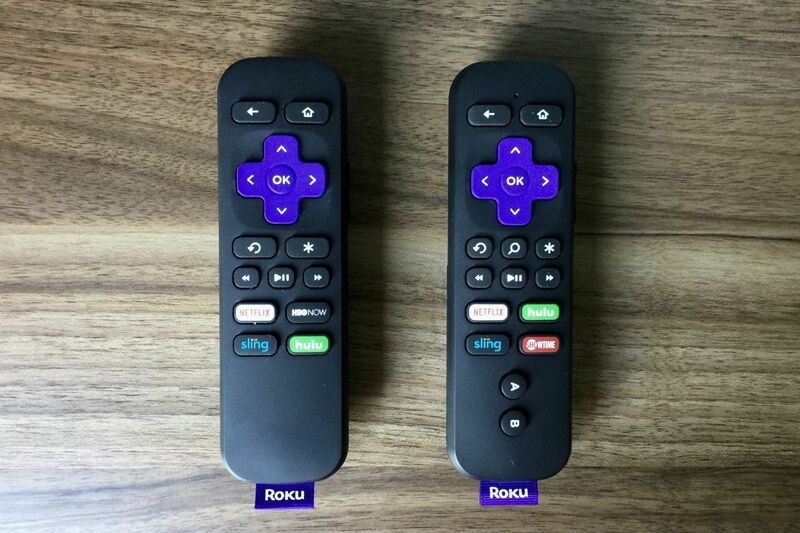 The Roku Ultra is one of three new Roku players with identical designs and processing power; the other two being the $80 Roku Premiere and the $100 Roku Premiere+. 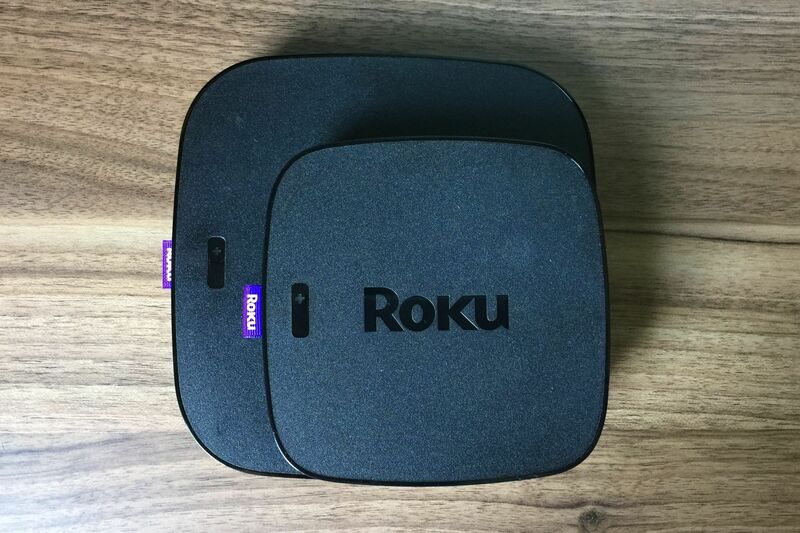 Each maintains the rounded, glossy edges and matte top of the Roku 4, but each is about 40-percent smaller in surface area and they've all dropped the internal fan, so you needn't worry about the noise of active ventilation. Compared to the Roku 4, the Roku Ultra consumers a lot less room on your TV stand. That power tends to go to waste, however, because many Roku apps use a lightweight design template that runs smoothly on weaker hardware. The Roku Streaming Stick, for instance, provides similar swiftness in nearly all the apps I've tried, though it did struggle to scroll smoothly in Pluto.tv's detail-rich channel guide. The Roku Ultra could provide some future-proofing, but Roku's business plan is all about enabling low-cost hardware (that includes cheap smart TVs along with sticks and set-top boxes), so don't expect apps to become much more demanding over time. The main argument for getting one of Roku's pricier boxes is 4K HDR video, which is included in both the Premiere+ and the Ultra. If you have a 4K HDR television, the new format allows for greater color detail in bright and dark areas. While I haven't tested this on the Roku Ultra, the demos I've seen have always been more impressive than 4K alone, adding a noticeable pop to lighting and special effects. Hollywood doesn't offer much HDR content right now, but the Roku Ultra helps you find what's out there through its 4K Spotlight app. Currently, it includes links to Netflix, Amazon Video, and Fandango Now, along with a selection of TV shows and movies (from Amazon and Fandango Now only). 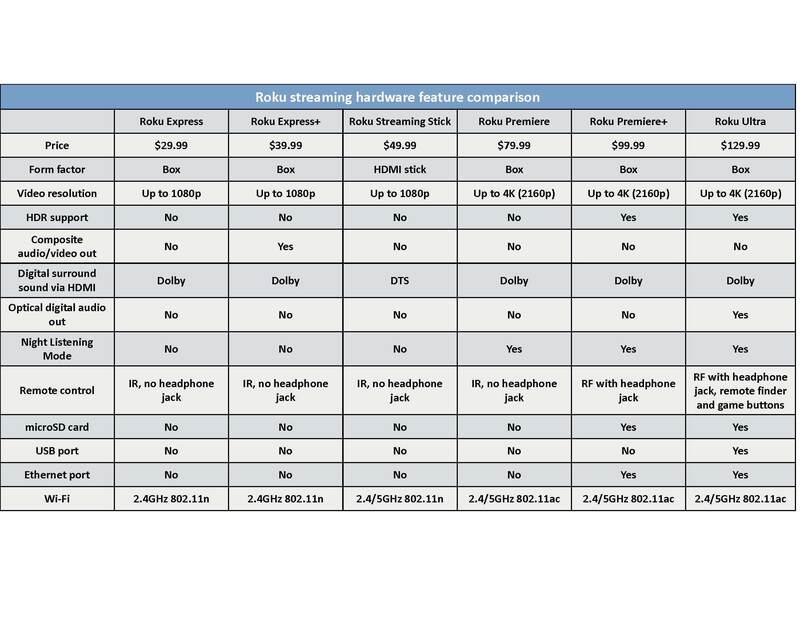 This table will help you decide which—if any—of the Roku streaming boxes is right for you. The Roku Ultra, Premiere+, and Premiere models also have a new feature called Night Listening, which normalizes volume to curb loud noises and emphasize quiet ones. It's a neat idea, but the effect is subtler than I was expecting; and counter-intuitively, it raises the TV's overall volume when you turn it on. The remote control's headphone jack remains the best way to avoid causing a ruckus. If you're sold on the idea of a high-performance, 4K-enabled Roku, you still have some decisions to make. The $80 Roku Premiere is the most bare-bones option, lacking HDR support and using an infrared remote, which requires line-of-sight to the box. I don't recommend this model unless you need a Roku that's compatible with infrared universal remotes. 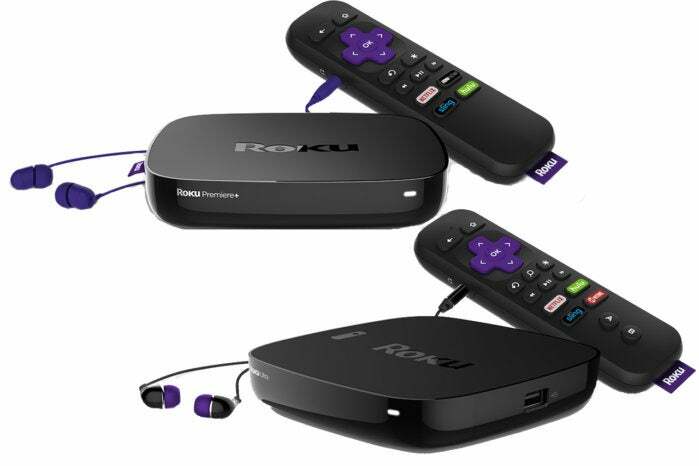 The Roku Ultra is the only new Roku model with a USB port for media playback from local storage and optical audio output. For $20 more, the Roku Premiere+ adds HDR, hardwired ethernet, a microSD slot for extra app storage, and a "point anywhere" RF remote with a headphone jack for private listening. I'd argue that this is the sweet spot in Roku's 4K lineup. As for the Roku Ultra, most of its extra features cater to niche use cases, such as USB storage, optical audio, and extra remote buttons for casual gaming. The remote also has a speaker to help you find it when you press a button on the box, which is admittedly a nice touch. Unlike the Roku Premiere+ remote (left), the Roku Ultra remote has gaming buttons, voice search, and a speaker to help you track it down. Most notably, the Ultra is the now the only Roku model with voice search on the remote, as it's been relegated to Roku's mobile app for its other models. You might think giving up voice search is a big deal, but Roku's implementation is a letdown, routinely failing to recognize show titles. (Westworld became "best world," Fast and Furious became "aston furious," and Mad Max became just "max.") And unlike the voice remotes for Apple TV and Fire TV, Roku's version doesn't support genre searches, music, general queries, or smart-home controls. Voice control just doesn't seem like much of a priority for Roku. Those remote-control issues echo some larger concerns about the Roku platform as a whole. The interface's focus on individual apps is starting to seem outdated next to the content-centric Fire TV and the upcoming TV guide app on Apple TV. Many Roku apps are also showing their age, as content providers start building slicker, more feature-rich apps for other platforms. 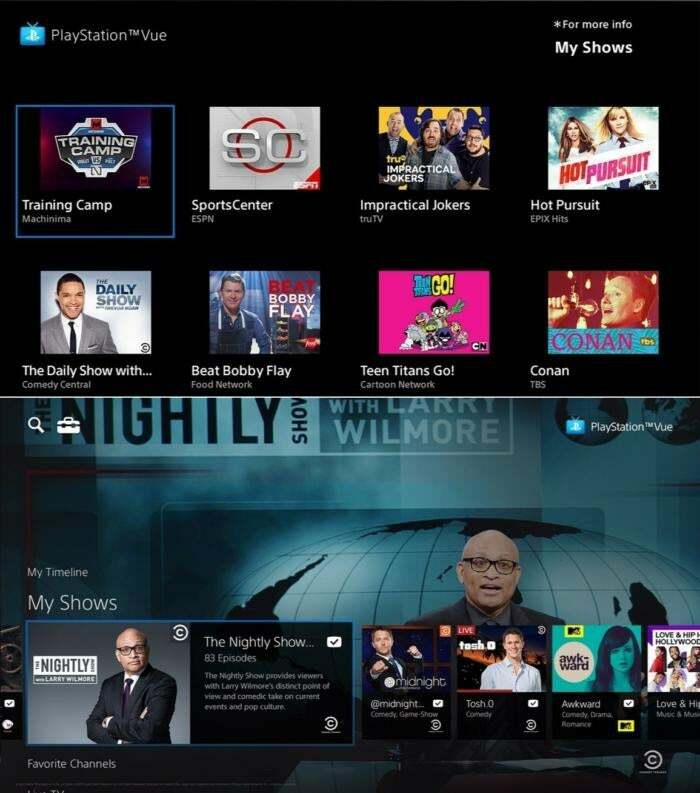 PlayStation Vue's Roku app (top) versus the Amazon Fire TV version (bottom). That said, Roku still has some clever ideas, including its Roku Feed feature that alerts you to new TV episodes and price drops on movies, and the ability to listen through headphones from any Android or iOS smartphone. And while Roku's interface isn't exactly forward-thinking, it is easy to understand. 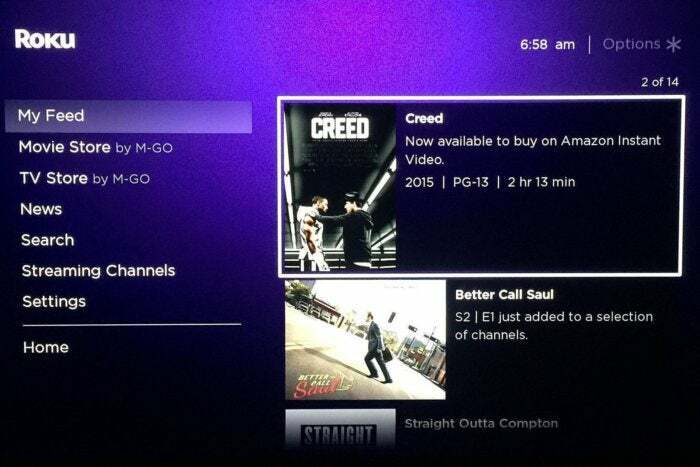 Roku Feed helps you keep track of favorite movies, TV shows, and actors. My advice for 4K HDR TV owners? Grab the Roku Premiere+, unless you have a specific need that's only met by the Roku Ultra, such as USB storage or optical audio out. As for regular HD viewing, cheap dongles such as the $50 Roku Streaming Stick and $40 Amazon Fire TV Stick are starting to look like the new normal. Correction: The feature table in this story was updated.